STARTING SMALL SERIES: Polka Dot Print Shop – Little Adi + Co.
Hi! I’m Leslie, mama of 4 and owner of Polka Dot Print Shop. 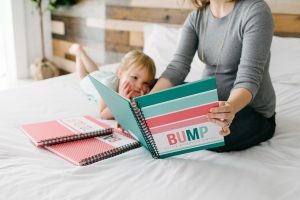 We create modern Bump, Baby and Toddler Books to document life’s most precious memories. Our babies grow up way too quickly and one day, we’ll wonder where the time has gone. Each of our books are designed with busy moms in mind. They’re modern, stylish and timeless and don’t require hours upon hours to fill out. We are proud to offer products that are 100% made in the USA with each one hand assembled during naptime and late into the evening hours. 1. Where were you when you came up with the idea for your business or discovered what you wanted to do! My business was created just a few months after my first baby was born in 2011. After unsuccessfully trying to find a baby book that I loved, I decided to create my own. 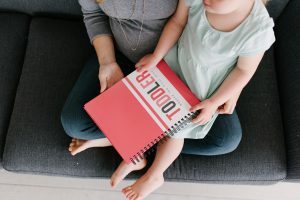 As a former English teacher and Yearbook Advisor, I had all of the digital tools and know how, so creating my own baby book was a no brainer! Initially, I designed the book just for me so that I could document my growing girl. Once it was done, I got the itch to post it for sale on Etsy… just as a hobby, as something to keep me busy during nap-time. Never in my wildest imagination did I think that my little nap-time hobby would turn into a full-time job! 2. What’s the first thing you do every morning to start your day on the right foot! I have an alarm set 1 hour before I need to get my kids up for school so that I get an hour to myself to answer emails and do a bit of computer work. I also make sure that I’ve got my daily to-do list made so that I have a clear focus for the day start to finish. Without my to-do list, I often find myself with a million partially completed tasks which then becomes really overwhelming. 3. Name your greatest success (or something you’re most proud of) in your business experience. Knowing that my little business can 100% sustain our family is such a great feeling. A few year ago, I decided to either go big or go home. And we went big and succeeded! I’m able to stay home with our kids, take care of all of their needs, attend school field trips and do all of the fun things while still having a full time job that I can work on my own schedule. 4. Has learning from a mistake ever led you to success? Absolutely. Our very first run of hardcover books was a huge flop. I changed up the design from our (then) current personalized softcover books without having tested the new design. It wasn’t well received and I felt so deflated. I could have closed up shop then and there, but I decided to give it one more go. With a few tweaks, some advertising and lots of finger crossing, my business exploded. I am so, so thankful that I didn’t give up after that first run of hardcovers. 5. What is your favorite thing about your workspace? I love how bright and airy my home office is… I’ve got a wall of windows that constantly lets natural light in. 6. Which of your traits are you most proud of? I am super organized. 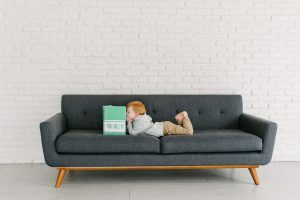 When friends and family tell me that they don’t know how I manage to run a business and take care of 4 young kids all day, I always tell them that it is 100% because of how organized I am. 7. In moments of self-doubt, how do you build yourself back up? Anytime I think that I can’t do something or I get overwhelmed and want to walk away, I simply shut my office doors for a day or two and take a break. I’ll spend time doing other projects or take the kiddos out to do something fun. For me, self-doubt usually sneaks in when I’ve been working too hard for too long without any real breaks. When it’s time to start working again, I feel refreshed and can usually pick up right where I left off! 8. What quotes inspire or motivate you? Success is knowing that I’ve done everything in my power to do the best job possible, whether it’s business, family or personal related. If I’ve given it my all, then that’s all that matters. 10. Name a woman (or women), past or present, whom you admire or look up to. I love Oprah Winfrey. She is so, so inspiring. She’s selfless, she’s dedicated and she stands for what she believes in. Want to learn more about Polka Dot Print Shop? Check out the links below!